Before any policy is voted on by the seven-member board, community members are encouraged to speak in favor of or in opposition to the proposed policy. Typically, a proposed policy is brought to the board for more than one reading before it is approved. All of the school district policies are housed on the TCSD Board Docs website. To review a proposed or current policy go to the District website, www.tooeleschools.org, and select Board Docs/Policy, under the Board of Education tab. Patrons can also go directly to the Board Docs website, https://www.boarddocs.com/ut/tooelesd/Board.nsf/Public#. 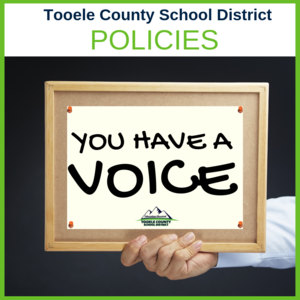 If employees or patrons have comments about a policy, an email can be sent to policy@tooeleschools.org or specifically to a citizen’s Board of Education representative. A map of voter precinct boundaries can be found on the Tooele County Clerk’s website, http://www.co.tooele.ut.us/clerk/pdf/maps/CountyWideSchoolDistrict24x36.pdf. Patrons can also sign-up to speak to board members during the public comment portion of BOE meetings. Meetings are normally held the second Tuesday of each month at 7 p.m. in the District Office Board Room, (92 Lodestone Way, Tooele). Policies help hold schools and educators accountable to the public and the BOE is endowed with the legal power to create and enforce such policies. Policies are typically created out of a need to help determine what the procedures are within a school district, so that educators, staff, and students know what is expected and can act accordingly. This saves time, prevents confusion and unifies the school. The board’s mission is to do all things necessary for the maintenance, prosperity, and success of the schools and the promotion of education. The BOE reviews all current policies on a regular, rotating basis to make sure they are up to date, relevant, and meet current laws. If you have any questions or concerns about proposed or existing policies please email policy@tooeleschools.org, reach out to your respective BOE member, or contact the District office at 435-833-1900.